Addressing climate change and natural resource depletion has been key to the international and national sustainability agenda for almost 30 years. Despite existing efforts, global CO2 emissions and raw material use levels continue to grow. This seems to suggest the need for more systemic approaches in environmental policy. 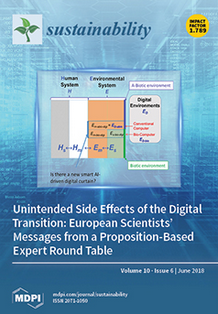 The authors, among them Ecologic Institute's Dr. Martin Hirschnitz-Garbers, call upon policy makers to integrate rebound mitigation strategies and move beyond exclusively improving efficiency to tackling structural and behavioural changes. The article is available for download. Our paper contributes modelling results to assess the potential of efficiency improvements to achieve absolute decoupling of global raw material use and environmental impacts from economic growth. We apply the global, dynamic MRIO model GINFORS to simulate potential effects of raw material efficiency improvements in production against a climate mitigation scenario baseline. Our simulation experiments indicate that (rather radical) progress in the raw material efficiency of production technologies in concert with extensive climate mitigation efforts could enable an absolute decoupling of resource use and CO2 emissions from GDP growth at a global level and for some countries. The absolute raw material extraction levels achieved, however, still exceed the material use reduction targets suggested by sustainability scientists. Our findings highlight that achieving such targets without addressing rebound effects is implausible. 1.3. A Need for Going beyond Resource Efficiency Oriented Policies? 2.2.1. Why Use a Dynamic Macroeconomic Simulation Model?